Cats love toys and need them in their daily lives for stimulation, exercise, and most of all fun. There are tons of cat toys available to purchase, and when you are deciding which cat toys to buy your cat, there are some important things to consider. This article discusses some important factors to consider when choosing safe toys for your cat. The most important thing you need to consider when choosing safe toys for your cat is that there should be no small parts that can become detached from the toy that your cat can ingest. You also want to make sure there are no strings, yarn, or other fabric or material that your cat can pull off of the toy and eat. 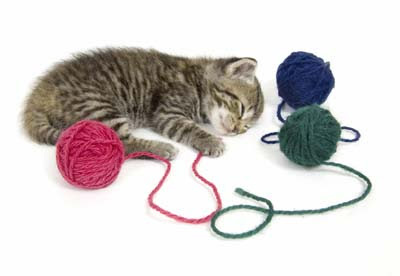 While cats do love yarn and string, these items can pose a serious health and safety risk to your cat. Never leave your cat unattended with string, yarn or any small objects because they can easily swallow it and it can result in a medical emergency. Cats love to put things in their mouth and if they begin to swallow yarn or string it will result in serious medical problems or even death. Small objects should also be avoided as they can pose a choking risk, and if they do swallow the object it can cause an obstruction or other problems. If you find a toy that you really want to buy for your cat but it has small parts, string or yarn attached, you should remove them and throw them away before giving it to your cat. If you enjoy playing with your cat with yarn or string its should be done only under close and direct supervision with you, and you must take it away from your cat and keep it in a safe place where your cat cannot access it when you are not around. If you purchase toy mice for your cat, you really should remove the tail, and all small parts such as plastic eyes, ears, etc...Just think of it this way: If you can remove something from the toy, your cat probably will be able to as well. Cats do not care about the plastic eyes, ears, tails made of string etc...they are put on these toys to make them more appealing to the person buying the toy, and your cat will enjoy the toy mice just the same without all these add ons. Chances are, your cat will have access to these toy mice when you are not around and you do not want your cat to pull off and eat potentially harmful objects. If you take the time to choose safe toys for your cat, you can avoid medical emergencies that often result in the cat needing emergency surgery to remove whatever foreign object the cat has eaten. Consider your cat's natural hunting instinct when purchasing toys to keep your cat stimulated and prevent boredom. 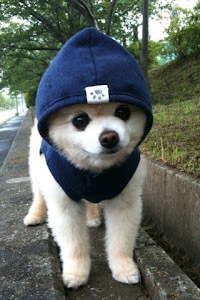 There are many kinds of safe toys that you can buy that you place cat food or treats inside. This stimulates your cats brain to try and figure out how to get the food out of the toy. 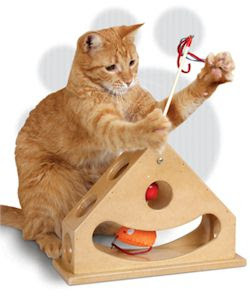 These kinds of toys can keep your cat amused for hours, providing mental stimulation and exercise that all cats need. Again, just make sure you inspect the toy before you give it to your cat to make sure there are no unsafe parts.